On April 11th, 2012, a giant earthquake and a massive aftershock rocked the seafloor of the Indian Ocean off the coast of Indonesia. Not only were the earthquakes some of the most powerful ever recorded, but they also puzzled scientists. Massive slabs of crust slid as far as thirty meters, creating tremors that could be felt in India, and twisted the bedrock with such intensity that several new fault lines formed. But these earthquakes were centered in the middle of a tectonic plate, far from any established fault lines, which was highly unusual. Recent studies of the earthquakes suggest an uncommon and significant explanation for this incident: the splitting of one of the Earth’s tectonic plates. A map of the April 11th, 2012 earthquakes off the coast of Indonesia showing the epicenters of both the initial quake and the aftershocks. The earthquakes were unusually strong for their distance from the nearest plate boundary. Photo courtesy of BBC News Asia. The vast majority of earthquakes are caused by the movement of tectonic plates, pieces of the Earth’s crust and upper mantle that fit together like the pieces of a jigsaw puzzle. The plates are not static, and build up immense amounts of strain at their borders as the mantle flowing underneath propels them forward, making them catch on other plates. When the plates finally break free, they release this energy in a matter of minutes as powerful waves, generating an earthquake. Since the plates only interact with each other at the borders between them, this is where the vast majority of earthquakes occur. However, the 8.6 and 8.2 magnitude April earthquakes were focused in the center of the enormous Indo-Australian Plate, a point hundreds of kilometers from the closest plate boundaries. “These were the kind of events that made seismologists do a double-take,” said Maureen Long, an assistant professor in the Geology and Geophysics Department at Yale University, in reference to the April earthquakes. “If you had taken a poll of seismologists before these events and said ‘Is this possible?,’ most seismologists would have told you no, including me.” For incredibly powerful earthquakes like these to occur so far out of the way, an unconventional explanation was necessary. The tectonic plates of Earth. These regions of the lithosphere fit together like a jigsaw puzzle, constantly colliding and interacting with each other as they drift. Courtesy of University of Wisconsin Eau-Claire. Scientists now agree that the unusual earthquakes are matched by an equally unusual cause. In 1986, an article published in the journal Techtonophysics observed “intense intraplate deformation” on the Indo-Australian Plate. The lithosphere in this region was being warped like modeling clay in the same location where the 2012 earthquakes would later occur. According to seismologists today, the deformation mentioned by the paper’s authors is an active process that is gradually ripping the tectonic plate into two. Eventually, this may create a localized boundary on the Indo-Australian Plate. Creating two new plates would certainly involve magnitudes of energy on par with those seen in April, but the necessary strain needs to come from somewhere else. 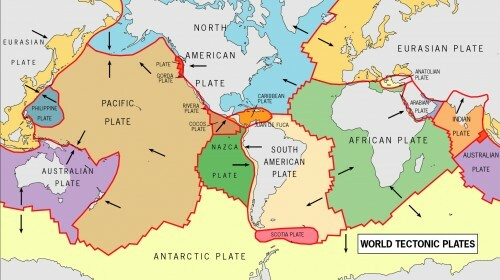 A recent study by a team at the University of California Santa Cruz concluded that the internal strain on the plate is the result of differences in the movement of the Indian and Australian regions of the plate. While the northwestern Indian section collides with the Eurasian plate, the Australian border shoves into Sumatra to the northeast. Like pulling on the opposite ends of a wishbone, these opposing forces subject the center of the plate to great internal stress. When the crust reaches its breaking point, an event like the one in April this year occurs. 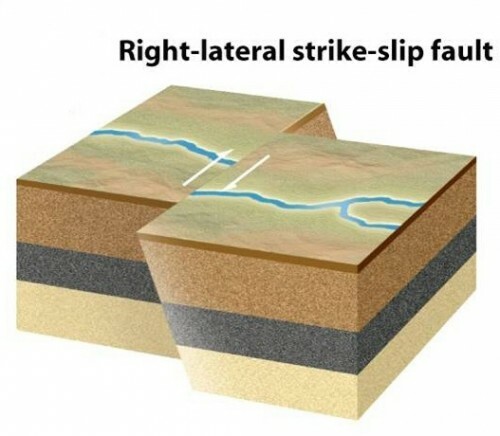 A schematic of a typical strike-slip fault similar to the ones observed in the Indian Ocean earthquakes last April. Large slabs of crust slipped over 20 meters along several such faults, unleashing massive amounts of energy indicative of the splitting of the Indo-Australian plate. Photo courtesy of the Southern California Earthquake Center at USC. The severe strain in this diffuse deformation zone led to a peculiar series of earthquakes. The Santa Cruz team found that the earthquakes were caused by ruptures along four distinct faults whereas most earthquakes involve just one. The faults were also incredibly deep, extending far into the mantle, and were reported to slip 20–30 meters in just a few minutes. Such massive release of energy is seldom seen, even on the most active plate boundaries. Only the enormous internal strain caused by the splitting of a major plate could create extreme lithospheric deformation and earthquakes unheard of miles from the nearest plate boundary. The earthquakes of April 2012 have been some of the most intensively studied tectonic events and their significance has yet to be fully understood. Such powerful ruptures far from plate boundaries have altered the way seismologists think about the causes of earthquakes. Uncommon earthquakes like these provide scientists with significant insights into how our planet is shifting and changing, right underneath our feet.